The candles below are an example of the weight-versus-volume. Both of the candles have the same weight (8 ounces) yet look at the difference in volume (height). 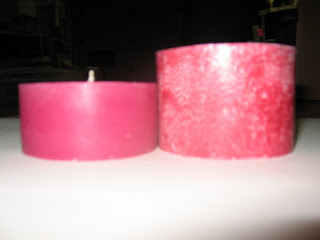 The candle on the left is a traditional paraffin based wax. The mottled looking candle is made out of a palm stearic soy combination. This example illustrates why soapmakers prefer measuring oils by weight to ensure precise lye usage. Joanna, I totally burned them but (embarrassed face) not together as any sort of test. That would have been a good idea, huh? Erin, did you ever get the cool postcard I sent you thanking you for the cheese? I’m so glad that you liked the cheese! The Drunken Goat is my fave! Have you done a burn test? I am curious how they burn – if differently, slower, etc…..
Erin, I so agree with you. I spent a long time on the phone today with a customer who just refuses to weigh her lotion recipes and is having problems (thus the call to me with technical questions). To each his own though, right? That’s how this blog post came about. The Weight Volume thing can by a mystery in concept – but when you see the photo? It’s pretty clear why weight is so important to the science part of soapmaking. PS – I finished the Goatcheese & Cheddar already. I have half of the Gouda left and all of the Fontinella. I’m saving it for some awesome fondue this Sunday. =) Thank you again! Knock on my wooden mold…I measure everything exactly (according to the recipe) by weight when making my C/P soaps. And, although I’ve had a few batches that took me by surprise by tracing pretty quickly, I have never had a bad batch! It really does pay to measure accurately – using a high grade/reliable scale! I have to show my 10 YO this! Great math example.